Data Economy, the leading data centre and cloud publication launched in 2016, has released its first magazine in Monaco during Datacloud Europe 2017. The magazine includes 80 pages full of content, with more than 20 C-level interviews in the fields of data centre, cloud and data. 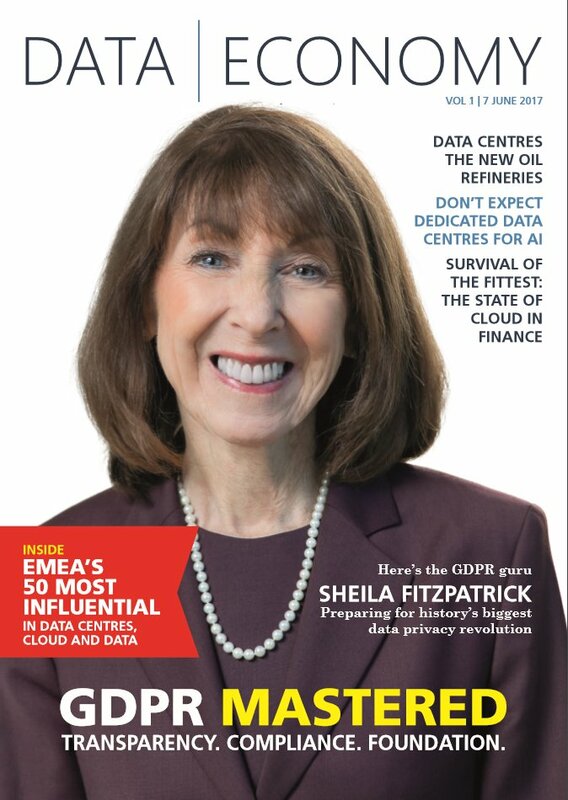 The first edition features on the front page global attorney and NetApp’s chief privacy officer Sheila Fitzpatrick, who has looked into her GDPR crystal-ball in an in-depth conversation with Data Economy, including the implications of GDPR and Brexit. Data Economy has also run the Data Economy EMEA 50, which lists the industry’s top minds in data centre, cloud and data in the region. The top influencer Michael Tobin was announced at the Datacloud Awards 2017, held in Monte Carlo every year. Other topics of coverage include AI in data centres, the state of cloud in finance, data centre reality checks, disruptive technology, containerisation of infrastructure, data decentralisation, automation, and more. Data Economy has also looked into emerging markets such as Africa and Vienna, Austria. Keeping up with its Millennials-driven coverage, the publication has interviewed younger industry faces leading innovation in the container and software segment. The magazine was directed and edited by Data Economy’s founding editor João Marques Lima. “The launch of our magazine at the premier Datacloud Europe 2017 in Monaco was the most exciting addition to our brand so far in 2017,” said Lima. “As we close H1 2017, we have achieved results beyond our expectations with significant growth rates and a widening regional scope. Data Economy launched on September 14, 2016, at an exclusive rooftop event overlooking London. The brand has since achieved new milestones including the acquisition of datacentres.com in November 2016 and the acceptance into Google News in January 2017. Data Economy is part of publishing and events company Broadmedia Communications, recently acquired by Euromoney Institutional Investor PLC, which is listed on the London Stock Exchange and is a member of the FTSE 250 share index. Data Economy’s is targeting a worldwide elite of C-level IT and operations professionals responsible for making critical infrastructure and business decisions that impact not only their businesses but the thousands of enterprises across the globe and the more than three billion internet users. Visit the website at www.data-economy.com. You may also follow Data Economy on Twitter @dataeconomy, on Facebook @dataeconomytoday, LinkedIn, Instagram, Google+. For any questions regarding the publication, get in touch at enquires@data-economy.com. For advertorial opportunities reach out to advertising@data-economy.com. Public relations professionals and media personnel alike can reach João by email at joao.lima@data-economy.com. He is also on Twitter @joao_pmlima. This press release was distributed by ResponseSource Press Release Wire on behalf of BroadGroup in the following categories: Media & Marketing, Manufacturing, Engineering & Energy, Computing & Telecoms, for more information visit https://pressreleasewire.responsesource.com/about.